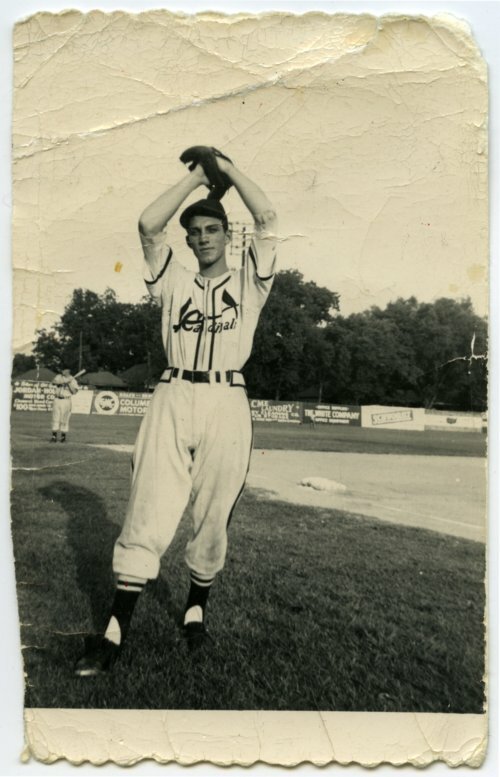 Topekan Harland Coffman is shown in this photograph from 1950, when he was a right-handed pitcher with the Columbus (GA) Cardinals, a Class A club in the South Atlantic League. His record that season was 17-11, with an ERA of 3.37. Coffman pitched for several minor league teams between 1948 and 1952. Besides Columbus, he also pitched for minor league teams in Independence (KS), Joplin, Omaha, Houston, Rochester, and Columbus (OH). In 158 minor league games, he achieved an overall record of 62-46, with an ERA of 3.19. His best year was 1948, when he went 18-5 for the Independence Yankees, an affiliate of the New York Yankees in the Kansas-Oklahoma-Missouri League. In 1952, he participated in the St. Louis Cardinals' spring training camp, but did not make the team roster in the regular season. His professional playing days ended when he suffered an arm injury and opted not to have surgery recommended by doctors to extend his baseball career. After his minor league career, Coffman played several years with the semi-pro Topeka Decker Oilers. In the late 1940s and 1950s, the Decker Oiler team was a perennial contender for the state semi-pro baseball title, competing each year in the state tournament held in Wichita. Harland's father Vern was the long-time manager of the Decker Oilers. Other family members who played with the team were Harland's brother Burton, and his uncles Ed and Junior Coffman. Harland was a lifelong resident of Topeka who worked 34 years for the Topeka Capital Journal. He died in 2010 at the age of 81. Digital reproduction of the photograph was accomplished through a joint project sponsored by the Kansas Historical Society and the Shawnee County Baseball Hall of Fame.